Most of the day to day noise you hear around the financial markets is just that, noise. Some people spend their days trying to analyze which direction a stock is going to move based on chart patterns or earnings releases to try and "trade" the market correctly. I have repeated countless times that trying to "trade" against Wall Street's machines is like trying to beat IBM's Deep Blue in chess. A waste of time and money. What happened on Tuesday with the mini Flash Crash, or the Hash Crash, was more than just noise. It perfectly symbolized exactly what the stock market has become and provides a crystal clear preview for what awaits in the future. 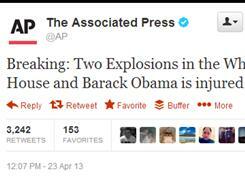 A hacker broke into the Twitter account of the Associated Press and posted that a bomb went off at the White House and the President had been hurt. What followed was fascinating. The algorithmic machines, also known as high frequency trading machines, picked up on this headline and it triggered automatic sell orders. 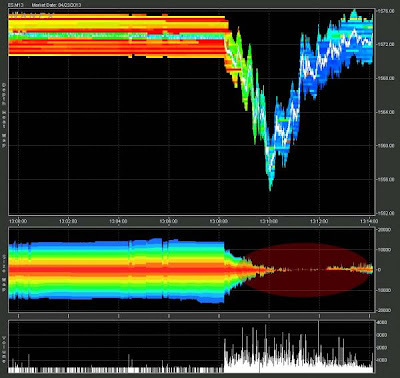 The market went into free fall, a flash crash, as the bids (buy orders) disappeared. The following graphic from Nanex illustrates this moment beautifully. You can see the market trending along at a normal pace with the machines providing their normal level of liquidity. Then the tweet hits and you can see in the red oval that all bids disappeared. The machines put in their instant sell order (before a human would ever have a chance to react), and then they went into hiding. This is exactly what took place during the May 6, 2010 Flash Crash, only it lasted much longer and the sell off was far larger. 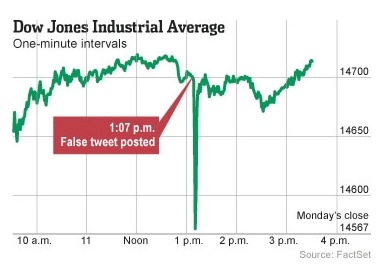 What has changed in the market since that terrifying afternoon when stocks entered free fall for close to 15 minutes? Nothing. There is nothing in place today to stop that from happening again. The only thing that has changed is that these machines now have a far greater control of the total volume. Wall Street exchanges love them because they have become the main source of their revenue. I have discussed in the past how these high frequency machines loot the markets, and if you have not read the book Dark Pools, I highly recommend you do so. When you get a firm understanding of how the stock market actually works today, you will see why I repeatedly say that someone trying to day trade the market has a far better chance of winning at the casino tables. This does not mean you should not buy stocks. The market still provides discounts to strong companies that should be bought for a long term cash flowing position, not something that you hope to flip 5, 10, or 15 minutes later. As a quick example of how traders were crushed on Tuesday, think about those that had stop orders in place before the #Hash Crash. A stop order triggers an automatic sell order when the price of a stock falls to a certain level. When stocks plunged during the 3 minute span it was very likely a trader with a stop order had it triggered. The stocks then bounced back immediately when liquidity came back into the market (the machines saw it was all clear) and that trader was left holding a sell order ticket below where the stock is currently trading. This is just one simple example. I could provide countless others. One day a crash bigger than what we experienced on May 6, 2010 will occur. The argument for high frequency traders is that they provide liquidity to the market. As just shown above, they provide liquidity to the market when it is not needed. When they are needed to step back in and create a functioning market, the algos sell and then turn off. What will be left after the "big one" is 401k's and many lifetimes of savings that will be destroyed. BIGPROFITBUZZ is a stock advisory firm which provides tips for equity intraday, future intraday nifty intraday & option Intraday. We have good past result of tips that is why we are able to sustain in stock market. We basically provide call in only blue chip stocks on which nifty runs. So we are always on profit whether market is bull or bear because we trade only in those scripts who run the market like SBIN, ICICIBANK, LT, RELIANCE etc.In which the most powerful stock is State Bank of India. If you want to do intraday trading then you must have to know the behaviour of this stock. NIFTY is like a King in stock market who shows overall performance of market. NIFTY runs on these blue chip stocks. You can understand this by a simple example that consider a king who has a vehcle with ten horses. In SHARE MARKET NSE BSE TRADING TIPSthese horses one is most powerful & others are his follower same like this Nifty is a king who is completely most of the time runs on the behaviour of SBIN & other stocks. So always keep in mind the direction of the SBIN to trade in intraday in the market. We always know the direction of this Stock that's why we know the market everyday & trade with confidence & earn handsome profits. so no matter you join us or not but always consider the SBIN as a market mover for you trading or investment. At this moment, It is a fabulous and effective website about financial market. It is a very beneficial for us. So, I like it very much. Many many thanks for make this website. If you want more informastion about stock screener to visit stock screener A lot more advanced Stock Screener demands way more right from investors. There is, overall, 3 locations to every qualifying measure arranging: the actual qualifying measure distinction, the worth plus the condition. This qualifying measure is a presented quantitative metric, for example the P/E relation, plus the significance refers back to the numeral concern within the measure. I don't like when stocks compare to casino. Casino is different type. It is just for entertainment. Play and win https://casinority.com/how-to-win-at-the-casino-real-big/ Just have fun, guys!